As a rug retailer, are you watching your traffic and sales decline year over year? If you’re like we were, the slow death of your livelihood feels like there’s a wolf at your door. We understand. The wolf is waiting, watching and taking every opportunity to steal your business. It’s not your fault. You didn’t see the wolf coming. As a pup, he slithered up to your door slowly. At first, stealing only a few sales. Gradually, the wolf grew into the terrifying beast he is today. He is taking more customers every day and therefore causing your sales to decline. Now the wolf is threatening your way of life. 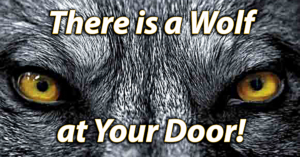 Amazon, Wayfair, and other E-commerce giants are the wolf at your door stealing your customers and your profits. The wolf spends billions of dollars to get your customers by leveraging huge amounts of product and customer data. Perhaps you recognized there was a wolf at your door and tried to do something about it. Maybe you put up a website and started social media accounts to meet the challenge head on. Perhaps you thought your customer service and personal touch would be enough keep your business relevant. After all, most people want to see and touch a rug before they buy it, right? Yet, you are still falling short and the wolf at the door is breathing down your neck. With unlimited resources to manage and leverage huge amounts of product data—the wolf has left you struggling to keep your customers and make ends meet. The wolf at the door is now coming in the house. Boost the performance of your E-commerce site with accurate product data feeds therefore increasing SEO, product selection, and online visibility. Datalink powers your retail business by streaming standardized, fresh product data directly to both E-commerce and POS systems in real time. Our revolutionary technology means that a vendor’s entire product catalog is available in just a few clicks. Better yet, products are automatically updated when new collections are released, items are discontinued, or prices are changed. With Datalink, you can focus on what’s important– growing your business and therefore no longer waste time searching paper catalogs or calling vendors to get answers. You can spend time with you customers. Those customers want to find you. They are searching for you. According to Google, most purchases start with an online search. Yet, the actual purchase happens within 20 miles from the initial search location. RM Innovation can provide the tools you need to stand out to your customers. To set yourself up for the best results, we recommend combining Datalink with RM Innovation’s award willing point of sale (POS) software RM Pro. RM Pro assists you in every key area of your business; Point of Sale, Smart Tools, Inventory, Relationships, Employee Management and much more. Fully integrated with Datalink, RM Pro enables you to have thousands of virtual products at your fingertips so you can service your customers quickly and effectively. Every retailer wants to avoid crisis and recognize opportunities. RM Pro helps you do both by continuously monitoring every aspect of business performance and operation, while automatically alerting you of significant events. Therefore, it frees you up to concentrate on business at hand without having to worry that you’re missing something important. Furthermore, it’s like having a team of CPAs and MBAs on staff to keep you ahead of problems and on top of trends without having them on your payroll. Contact RM Innovation today by emailing hello@rminno.com and get started earning your customers back from the wolf at your door. Stream Any Vendor's Catalog to Your Store in Real Time.